It's here! It's here! 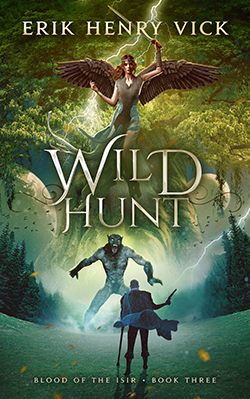 I'm happy to announce that as of midnight this morning (1/31), Wild Hunt, Blood of the Isir Book Three, is available for purchase or Kindle Unlimited download. It was a long, hard road to get this one out, fraught with health issues amongst my editors and team, as well as myself (more on that later in the week). Leonard Tillerman again wrote a launch day review of the book, and as usual, his review is a work of art in and of itself. Please take a moment and check out his website, and the review itself, and see if you don't agree. As usual, this is not a paid review, but the honest opinion of the best indie reviewer I've seen. I visit his site often in search of new authors to read recommend everyone do the same. Back to Wild Hunt! I enjoyed writing this book a great deal, as I am finally able to share a bunch of whoppers of twists that I've known about for a long time and haven't been able to share with anyone. Hank grows so much in this portion of the tale, and so much is thrown at him, that I got a vicarious thrill writing each and every scene (if you haven't figured out, Hank's character is based loosely on myself, so I put myself in Hank's shoes a lot while writing his tale).